Argan Oil from Bioelixire tempts mostly with the fact that can be used both on hair and body. This cosmetic has small volume (50 ml/1.7 oz) and dark plastic bottle equipped in pump. 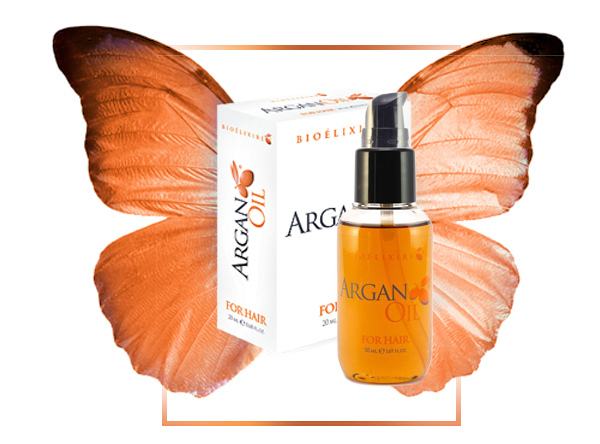 Bioelixire Argan Oil contains three natural oils. The leading one is argan oil – an invaluable oil, which properties protect hair both against mechanical damages and harmful impact of atmospheric factors (i.e. hot sun, freeze, strong wind). Argan oil takes care of hair ends and provides them with right level of moisture. This oil also ensures gloss and elasticity. Jojoba oil – is a unique oil, because it works perfectly on every hair type. It prevents oily hair against excess sebum and moisturises hair, which are breakable and dry. On top of it, this oil eliminates brittleness, takes care of cell renewal, perfectly conditions and helps with stylisation. Sunflower oil – is frequently and very willingly added to cosmetics for stylisation and regeneration of hair. Most of all, it strengthens and nourishes hair, but also prevents frizzing and ensures gloss and softness. Sunflower oil inhibits ageing processes of hair. What is more, this oil makes hair gain beautiful appearance. Content of 70% of essential fatty acids omega-6 group improves processes in cells. This cosmetic can be used on dry hair after hair wash or as a hair mask before washing. Additionally, you can use it for everyday care to provide hair with gloss. Nice alternative is fact that Bioelixire Argan Oil ensures possibility of application on body. Just rub oil in wet skin after a bath. Packaging is simple and aesthetic, and pump works flawlessly. The only drawback of this product is small volume for such a versatile product. It won’t last a month on the bathroom shelf.